Motorola Solutions has announced the launch of its innovative digital evidence management service on Amazon Web Services (AWS) cloud infrastructure in the UK. CommandCentral Vault will provide UK public safety organisations with a secure platform that helps streamline digital evidence management processes. When used in conjunction with body-worn video camera solutions, such as Motorola Solutions’ Si500, CommandCentral Vault creates a complete solution for digital evidence management. It automates the process of uploading, editing, and tagging video content while supporting the automatic correlation of meta-data saving time and resources. 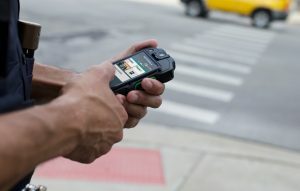 The use of body-worn video technology in the police has seen a 36 percent drop in assault-on-police cases after one year and an 88 percent reduction in the number of citizen complaints.1 Rich data (such as video) captured by devices like the Si500 and stored in CommandCentral Vault can integrate with record management systems, making it easier to correlate incidents to multimedia content. The launch of the new UK-based cloud service comes at a critical time with UK police, fire and rescue and health services all under pressure to cut budgets and refine working practices to improve the level of service provided to the public. This in turn has driven an adoption of cloud services across the UK public safety sector, with the majority of organisations (82 percent) looking to embrace cloud services, up 20 percent from a year ago.2 Motorola Solutions’ CommandCentral Vault meets this growing requirement and offers an end-to-end evidence management solution. Using CommandCentral Vault on AWS, UK public safety agencies will benefit from a seamless cloud-based digital evidence management experience for increasing amounts of multimedia content, specifically body-worn camera video. This means public safety organisations can store, edit, manage, and share video evidence by providing enhanced chain-of-custody controls for end-to-end security and content integrity. From the second data is created or collected by a device and uploaded to AWS, to the moment it’s shared, it is cryptographically secured in compliance with the toughest of government security standards.